Born in Minden, Germany, Gunda started her professional career with the International Organization for Migration (IOM), a 125 member states inter-governmental organization committed to migration and health assistance for crisis-affected populations around the world. She served in the organization’s German mission in Bonn as a deputy chief officer for five years. 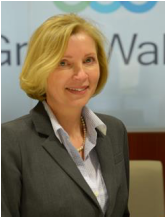 She was later admitted into the Professional Leaders and Executives Program of the German Federal Ministry for Economic Cooperation and sent to Caracas, Venezuela, where she worked for five years as assistant to the President of BASF Venezolana S.A. After her assignment in Venezuela, she moved to the U.S. in 2002, where she joined GreerWalker LLP, one of the leading certified public accounting and business advisory firms in the Carolinas. She currently serves as the firm’s Director of Business Development. She is a board member of the German Language and Culture Foundation, the Charlotte Regional Partnership, the Charlotte World Trade Association, and the N.C. Zeitgeist Foundation. She is also a member of the international honor society in business Delta Mu Delta. Gunda served as the Executive Director of the European American Business Forum from 2002 to 2007 and is a past board member of the Mental Health Association of the Carolinas. Gunda earned a bachelor degree from the Institute of Multilingual Communication and Translation at University of Cologne, Germany, and a MBA with a specialization in Marketing from New York Institute of Technology, Old Westbury, NY. She is a Certified Global Business Professional (CGBP) and speaks German, Spanish and English.